Dyson’s Dodecahedron started out (under the title of “A Character For Every Game) when I decided it was worth the time and effort to make two characters (one starting character, one “advanced” character) for every RPG I own. However, when you have a collection of 200+ RPGs, sooner or later you discover that a project of that magnitude is quite the undertaking. Slowly the blog transformed into a general RPG blog, where I talked a lot about the games I’ve played and how I like to play them. Then I started posting the occasional bit of house rules to go along with those posts. Then I posted a One Page Dungeon that I had written up for the One Page Dungeon Contest in 2009. I wasn’t happy with the map I drew for that dungeon, and started looking at the maps drawn by other members of my various RPG groups. I started to develop a new style for my maps. Not an “original” style overall – it is strongly based in the cartography I enjoyed from old Palladium and Chaosisum products, but significantly less like the style of the traditional D&D map which is very grid-oriented. Then I started to post maps drawn in this style. As I practiced the style, I challenged myself to draw a geomorph every other day until I had at least 100 geomorphs. 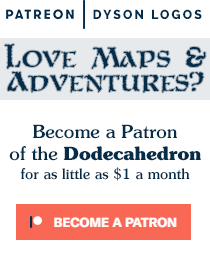 The blog got pretty boring during this stretch, but I learned a lot about mapping and dungeon design, and the blog got a reputation as a mapping blog. That reputation is well-earned now. The main content of the blog these days is my fantasy RPG maps, with a minor focus on “OSR” RPG content. I’ve got a few hundred maps on the blog now for you to explore, along with over a dozen adventures. I’m Dyson. I’ve been gaming since 1979 in a variety of game systems, but most often playing Dungeons & Dragons (particularly Moldvay Basic). But that’s not to say I haven’t played other games along the way, with dalliances in science fiction, cyberpunk, urban fantasy, and other game settings. I’ve even included a page about my 25 favourite games if you want a more concise history of my top RPGs. If you’d like to read about my long history with Dungeons & Dragons, I’ve answered a series of 28 D&D Questions also. More recently, Shane over at the Three Toadstools blog posted an interview he did with me. Do you ever do freelance work? I want to update an issue of of my fanzine (Iridia) and am in need of a city map that looks far less assy than the one I scribbled with my crayons. I wanted to ask you about your awesone one-page “Mapper’s Challenge” map. That map has been incredibly successful and popular in my campaign; I built a fully-keyed 200-room mega-dungeon out of it which I’m contemplating publishing in some format. If I were to go down that route, would it be possible to work something out with you to use the map for publication? Please let me know! You can email me at alex at escapistmag dot com. I just found your blog and I am totally blown away!!! I played D&D way back when in school, but dropped off the fasce of the RPG planet for about 20 years and have recently discovered miniatures gaming via Warhammer 40,000. I really love the various adventure modules you have posted and plan to try to run some of them using either Mordheim or Doctor Who Miniatures rules. It’s just a matter or making, painting and storing terrain – two of which are my most favorite activity! Thank you for being so prolific!!! I was wondering what’s the usage and redistribution licence for the maps and the geomorphs and what you are ok with. I would like to use some of your geomorphs in a deck of gaming cards/adventure generator thingy that I’m going to give away on my blog. Do I have your permission? I’ll give you credit in the project! I took the liberty of tracing and converting all your geomorphs in inkscape. Then I wrote a new generator (albeit a quick and hacky one) using them. http://dizzydragon.net/MapGen/ to run the generator and download the graphics packages. If you’d rather me not use your stuff like that, please contact me and I’ll remove it. Thanks for all your wonderful work, Dyson! Hello! I’m glad I found your excellent site. I am Brazilian and I’m posting on my own site a link to your blog. Congratulations on the job and have good rolls. I have a question for you, since your knowledge is vast in the realm of rping…: In your opinion, how difficult would it be to have a campaign with three or four different game systems versions? I am the co-writer for Torn World and we were looking into potentially releasing our stuff for different systems… our “standard” is Pathfinder 3.5 OGL, but we we thinking of maybe using the Step System (what Earthdawn uses) and White Wolf’s Storyteller system… but as you know, the rules for each of these are quite different. Do you think, or know of a way, that this could be done quickly and easily? Hi Dyson, just stumbled across your awesome blog by chance when looking for some other stuff. A truely great resource for someone who has great difficulty with maps – thanks for making them available for general use! More power to your pen! Has anyone seen or heard from dyson through any other sites/mediums? It’s quite odd that he’d just vanish without a word considering all the work and effort he went into this blog and this hobby. I’m not a “personal” friend, but I hope all is well none the less!! Hey, I subscribed a while back and I love your work! Do you use digital or traditional media? Here’s an article where I discuss my cartography. It’s all traditional media except for the grid overlay. i hope u r good n health ..
i wana get some help that i am student of MS(RS and GIS) i m working on my final thesis… in future i wana do my Doctorate with specialization in Cartography sooo can u suggest me institutes those offer this facility for international students…. Hi Dyson. I love your work. I just discovered your maps, and wanted to offer you my quick and dirty pdf of your MegaDelve. I’m sure there are mistakes and flaws, but others may find it useful. Maps! A world of their own! Getting lost and finding your way home! I found an old reddit post from 2014 in which you mention running a Metro 2033 Twilight 2000 game you’re working on – any chance of seeing that or some Dyson style maps anytime soon?